Candidates and their supporters are making the final push for Tuesday’s Primary election. Republican gubernatorial candidate Bob Vander Plaats rallied with about 300 supporters in Des Moines late Saturday morning, opening with a reference to the Tea Party movement. Vander Plaats delivered a 10-minute speech at the rally, responding with this when his supporters started a “We want Bob” chant: “If you want to open up this state for business, if you want to shrink government, if you want to provide world class education, hold the federal government in check, hold the supreme court in check, stand up for the sanctity of human life and traditional marriage — we need to win on Tuesday,” Vander Plaats said, to cheers. 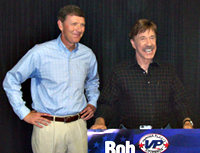 Vander Plaats, who is making his third bid for governor, campaigned with actor and martial arts champion Chuck Norris on Friday and Saturday. Norris has endorsed Vander Plaats, just as Norris endorsed and campaigned with Mike Huckabee before the 2008 Iowa Caucuses. Terry Branstad, the former governor who’s seeking a fifth term, made just one public campaign appearance this weekend. He walked in the “My Waterloo Days” parade on Saturday morning, as did the current governor, Democrat Chet Culver. 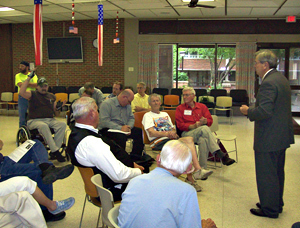 Branstad’s last campaign stop Friday evening was in Marshalltown, where he met with about 20 people at the Iowa Veterans Home. Branstad began by telling the crowd that he’s the only military veteran running for governor. “I’m a veteran of the Vietnam era. I served in the Military Police at Fort Bragg, North Carolina, and I’m proud to say that on Memorial Day this year — first time since 1991 — I got into my Army uniform,” Branstad said. 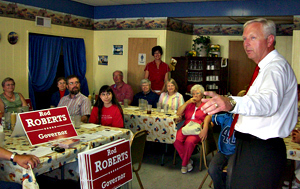 The third candidate in the race, Rod Roberts, made half a dozen campaign stops this weekend. On Saturday evening in Atlantic, about 25 people sat in The Farmer’s Kitchen restaurant for over an hour to listen to Roberts. Roberts told the group he’s not afraid to be considered the “nice guy” in the race because he hasn’t “bickered” with the other two candidates. Roberts suggested he may still have a shot Tuesday because, he argued, no one really has a handle on how many people will vote Tuesday. “Because the people have been awakened and they are aware of what’s been going on and I have never seen the kind of unrest, anger and frustration towards government that I now see,” Roberts said. Roberts did not mention Branstad by name, but Roberts promised he wouldn’t make being governor a career. “The founders never intended for elected office to be a career path,” Roberts said. “It was an opportunity for citizens to step up and to serve fellow citizens and, when your time is done, get out of the way and go back to the life you live like the rest of us do.” Roberts has served nearly 10 years in the legislature, representing the Carroll area. There are three other statewide races in Tuesday’s primary. Democrats will choose a nominee for the U.S. Senate. There are Republican primaries for two statewide posts as well. Two candidates are competing for the G.O.P. nomination for state treasurer and three candidates are competing for the Republican nomination for secretary of state.